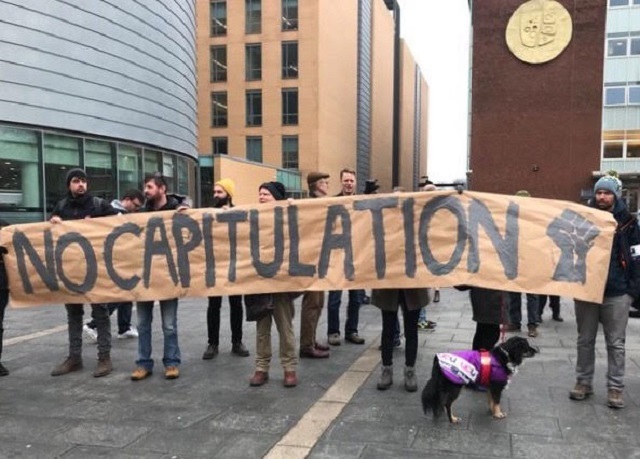 The solidarity and collective nature of the defiant stand taken these past few weeks by university staff and students across the UK has been commendable and inspiring. 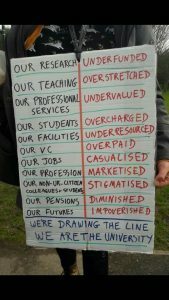 The strikes have prompted people from all levels of the university community to join the pickets; from lecturers, students, librarians and heads of schools, to post-doctoral researchers and newly appointed staff on precarious contracts (to name but a few). But the ongoing disputes are clearly about so much more than pension cuts. We have come out in numbers showing solidarity with one another because we are all well aware of the dire situation that has come to engulf the HE sector. The long and short of it lies in the fact that many of us are simply fed up. The current state of higher education in the UK is no longer sustainable. It is as simple as that. The pace at which UK universities have succumbed to brutal neo-liberal practices has been startling. Only recently, the action taken by junior doctors illuminated the painstaking conditions they face in an increasingly privatised NHS. In HE, the experiences of frontline staff are less known, although more and more are bravely stepping forward to expose the scandal that lurks behind the walls of the university. Many academics joined this profession because we are committed to our disciplines; we thrive on our research and get so much out of teaching our students how to think critically. However, with extortionate tuition fees and impossible demands to meet, the love for our craft is rapidly being destroyed. When we undertake PhDs, many of us envisage a fulfilling academic career. As a result, we close the door on other possible job opportunities and cement our faith into a life in Higher Education. As soon as we get a foot in the door, after sending our numerous applications, we are immediately faced with the severity of the situation whereby competition is the new norm. Early career academics find themselves taking on unmanageable workloads, working day and night, seven days a week, on insecure contracts. Those of us lucky enough to have permanent posts are tasked with heavy administrative roles and pressure to outperform via REF, TEF, NSS and personal development reviews — this on top of our teaching, writing and existing research projects. With threats to our pensions we are increasingly finding ourselves being pushed to our limits. This is a toxic environment in which the university has been transformed into a ruthless corporation. We are now merely ‘service providers’ while students are paying customers. For many of us, this shift is not only untenable but also deeply saddening, frightening and humiliating. When university managers talk to us about ‘work-life balance’, it seems like a cruel joke. Our wellbeing is compromised on a daily basis, we battle through our anxieties, we have no choice but to put our personal lives on the back burner, and we have to tolerate the fact that, day in and day out, our bodies and minds are exhausted. This, however, only scratches the surface. There are so many other issues that need to be addressed, including a persistent culture of racism and sexism; the ongoing exploitation of international students; complying with the Prevent policy; having to act as UK border agents; serving as careers advisors; and the endemic problems of grade inflation and lecture capture. The list goes on and on and on. We are well aware that this is the result of wider neoconservative government policies, which have crushed the public sector. But we must not be so easily fooled into blindly accepting this fate. Our strikes have shown that we have the power to push back — with or without support from the UCU, whose leadership appears to have internalised crass management logics. If we are to profoundly challenge the neoliberal university, we must continue our push-back, and keep our momentum going. The resounding rejection by UCU members of its appalling deal with UUK shows that, collectively, we have the power to change, resist and oppose backdoor deals which keep the VCs’ pockets bursting at the seams, while many of us struggle to keep up with our rent. Over 5,000 people so far have signed an Open letter rejecting the UCU/UUK agreement at ACAS. Our collective push-back has shown that we have the strength, courage and vision to fight for a university that works for everyone, not only now but for decades to come. This is the best thing I’ve read on the #USSstrike. Captures what’s at issue perfectly.